Though India has progresses a lot, the society still does not offer men and women an equal platform. Boys are preferred over girls in most families. Boys are given better nutrition and educations opportunities, while the girls lag behind. In rural areas, many see the birth of a female child as a liability. But state government of Uttar Pradesh is all set to change this condition. The new developmental scheme, named Bhagya Laxmi Yojana, has been targeted towards offering better opportunities for female children. Under this scheme, the state government will offer families financial assistance to raise and educate the girls. Development of poor girls – The main objective of this project is to develop the status of girl children in the state. If the state takes the responsibility of providing for the child financially, then the families will no longer see then as burdens. Financial help for the mother – As soon as the parents submit the birth certificate and application documents, the state government will offer a sum of Rs. 5100 to the mother. It will help her to take care of the child properly. 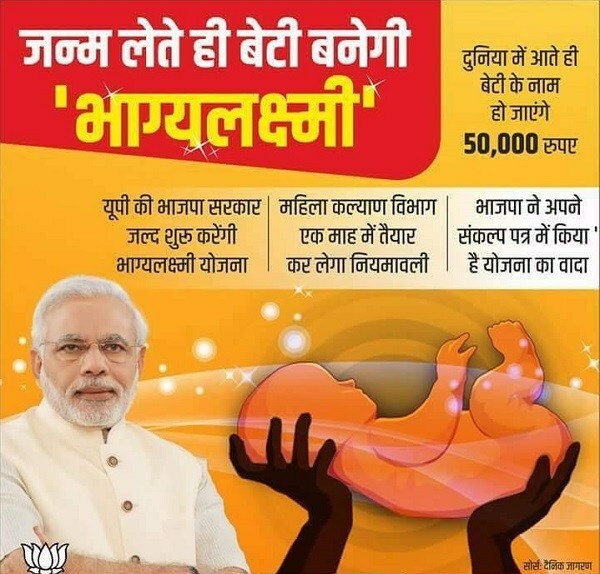 Bond in the name of newborn – The state will offer a total of Rs 50,000 in the bank account, in the name of the registered newborn female child. Two girls from each family – It has been mentioned in the scheme draft that each family will be able to register only two female children under this scheme. The parents must also adhere to the family planning rule of having only one more child. Withdrawal of interest amount – The banks will also offer a specific interest on the money that has deposited by the state. When the enrolled female candidate will reach 18 years, she will be able to withdraw that interest amount. Assistance for treatment – Illnesses are common, and the state government has ensured that each candidate gets proper treatment in case she falls ill. The family will receive a sum of no more than Rs. 25,000 to meet the expenses of the treatment. Assistance to family in case of normal death – If the female child, enrolled under this new scheme passes away in normally, due to any ailment, then her family will receive a sum of Rs. 42, 500 from UP government. Assistance to family in case of accidental death – In case the girl dies in a road accident, the state authority will offer the family as sum of Rs. 1 lakh. Financial Assistance for Marriage – At the age of 21, the girl will be given Rs 2 lakh for her marriage. Continuous financial assistance for education – Apart from the above mentioned financial assistances, the state desires to ensure that each girl gets equal opportunities to attain education, without worrying about financial hindrances. Thus, the scheme will offer continuous monetary assistance to the female candidates, as she progresses in academic education system. Legal resident of UP – As the scheme has been designed and sponsored by the UP state government, there are no extra points for guessing that it will allow only those families to enroll, which have legal residential papers of UP. In short, the newborn girl and her parents must be residents of UP. For BPL families only – It has been mentioned in the scheme draft that only those people will be able to register under the scheme that possess Below Poverty Level certificates. Income related criterion – The scheme draft also highlights that in case the annual earning of the family is more than Rs. 2 lakhs, then that family will not be able to get the benefits of this betterment project. Registration of birth – In order to receive the financial benefits of this scheme, the parents must get the birth certificate of the newborn girl made. Legal birth registration is very important. Only three children – In case the couple has more than three kids, then they will be kept out of this scheme. Admission of the girl in government schools – In case the enrolled candidates desire to continue receiving the financial perks under the project, she needs to take admission and continue education in any government school. Must not be associated with child labor – The state will not pay any financial assistance to the family if it is seen that the girl child is associated with any labor. No marriage before 18 years – The enrolled candidates will not receive any money from the state, in case they gets married before attaining the official age of 18 years. Residential documents – As the scheme is only for the residents of UP, submission of the residential documents is a must. The Aadhar card is a good ID as well as residential proof. Registration with Anganwadi – It is necessary that the pregnant mother and the newborn female child get their names registered in the Abganwadi centers. It will ensure proper health and vaccination monitoring. BPL certificate – As it is targeted towards offering financial assistance to the poor, all applying families must have BPL certificates. This paper is necessary for submitting the application form. Income certificate – As there is an income related criterion, the submission of the income certificate is also important. Birth certificate of the girl – The parents must not forget to attach a photocopy of the female child’s birth certificate. Without this official document, the application will be rejected. Ration card – Both the parents and the female child must have valid ration cards, issues by the respective local authority. How to apply for Bhagya Laxmi Yojana? The Uttar Pradesh authority has announced that all interested applicants will have to make an online registration to attain the benefits of this scheme. One can get access to the online application form by clicking on the link mahilakalyan.up.nic.in. Once the homepage opens, candidates will have to click on correct links to bring up the digitized enrollment form. Then they will have to type in necessary information in the enrollment form. Then they need to click on the “Save/Submit” button to save this application. Candidates need to submit necessary documents as well. Respective authority will use these documents to carry out background checks. Schemes like these will not only assist the poor families in offering better healthcare, nutrition and education to the female candidate, but will also give them an equal shot at progress. These schemes help to remove the hypocrisies of society, which have tagged girls to be inferior to boys. If the state and central governments come forward with such scheme, then the society will progress in true sense.